Hello! Today I have my nail art for October's 'Sugar Skulls' MeeBox to share with you. If you missed my unboxing and swatches of October's box, you can find my post here. Again, my posts are really late for this box - sorry! 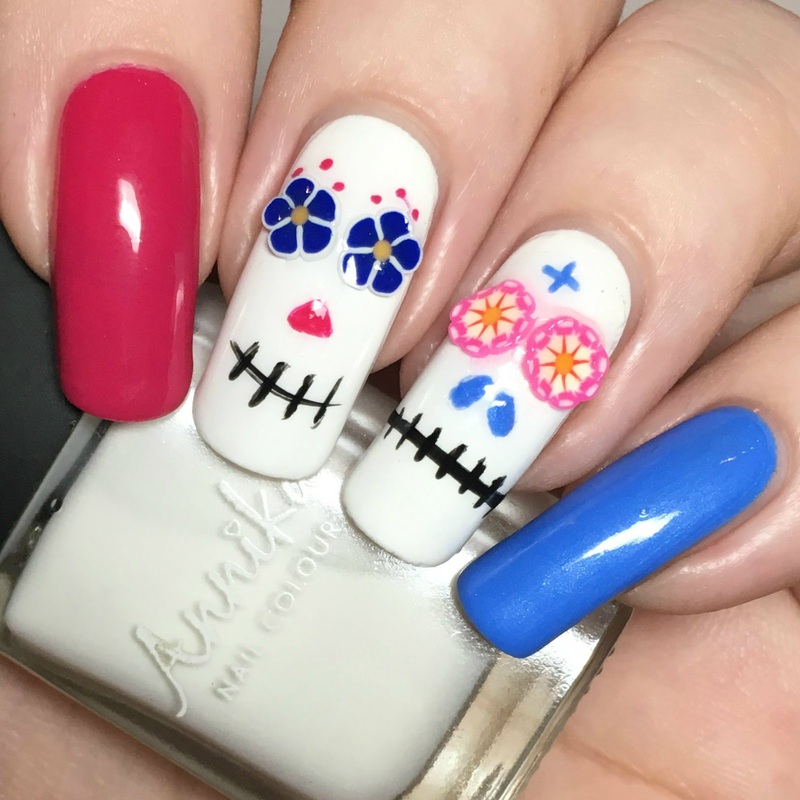 The MeeBox team gave us everything we needed to create our own sugar skull mani, so that's what I did! Read on to find out more! I started out by painting my middle and ring nails with Annika (by The Edge Nails) 'White Swan' as a white base for my skulls. I painted my index nail with Deco Miami 'Miley What's Good', and my pinky nail with 'Ard As Nails 'Taking A Dip'. All are shown below with topcoat. To create my skulls I used all three nail art items from October's box. I added filmo flower slices from Charlie's Nail Art as eyes, picking out pink and blue flowers to match the polish colours. I drew a different mouth for each skull using the striper brush on the WAH London black nail art pen. I then added noses and extra decoration using the Sparkly Nails nail art brush, and the pink and blue polishes. I finished by sealing everything in with topcoat. What do you think? I think I did a fairly good job considering I never freehand! I was impressed with all of the nail art items we received. I was expecting the little flower slices to pop off, but they stayed put until I removed them! I also found both the nail art pen and brush easy to use. November's MeeBox has already started arriving, so I should be posting that soon! What a fun use of fimo flowers!! Such awesome use of fimo! Ahhh! Love the sugar skulls! awww I love the skulls. Sugar skulls <3! Love the mani! 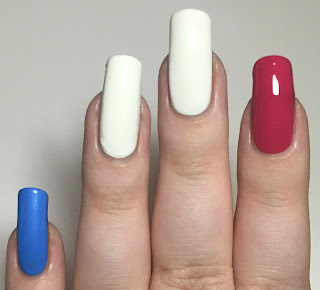 A lovely mani! The flowers look fab as eyes! Love what you did with this kit! Perfect sugar skulls! 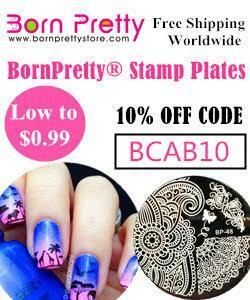 You've done pretty well for free hand and i like the nail art on the ring finger the most! So cute! :) The bright colors are nice! A perfect way to use fimo! Oh my gosh, your designs are so much fun!! Love it!! So fun and colorful!